Hey everyone. So, yeah, pretty hit and miss with the posting, right? One thing I've learned; illustrating the bible is NO JOKE. Things won't be fully back on track until that book is put to bed in mid-July. Sheesh. 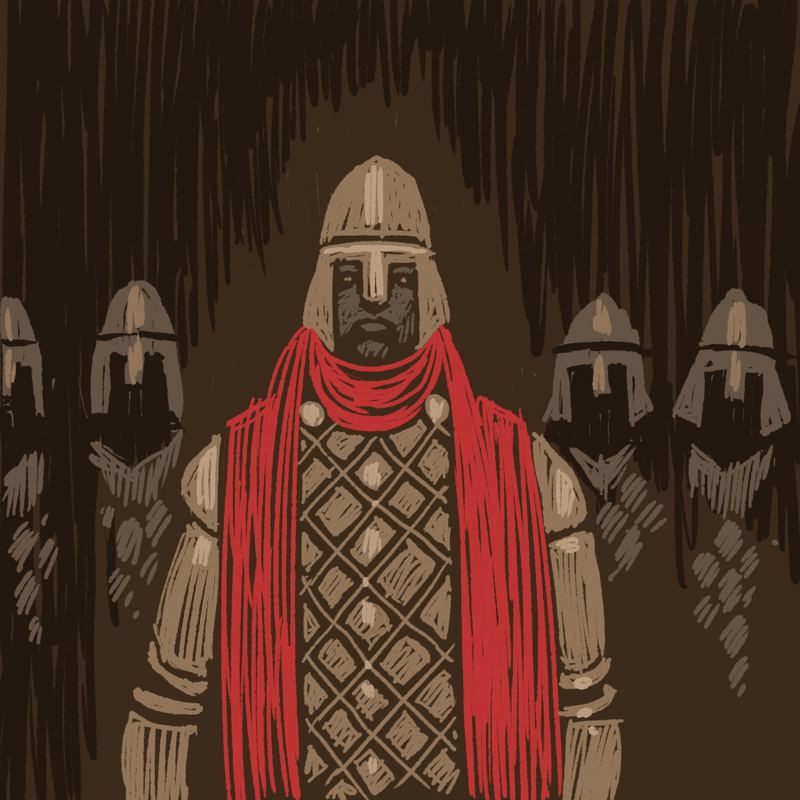 Here's a drawing of some cool knights or soldiers or something. No back story, just started with the brown and here's what happened. Tonight, Thursday night, I'm sitting on an illustrator panel at the Provo Library. It's at 7pm and it should be good. I'll have my HAZARDOUS TALES books there to show. Come say hi. If you buy or bring a book to have me sign, you can jump the line. But you have to be aggressive, shout, "OUT OF MY WAY! I JUST BOUGHT THIS NATHAN HALE BOOK!" Nathan Hale books will be sold on the premise. Be there! love those knights! Maybe you could get a friend or someone helping out w/ the Book Fest to take pics, so you don't have to try and remember it? That sounds awesome. So you do polyg portraits? I draw portraits of all comers. Not in groups, but one at a time. I swear sometimes it feels like I'm drawing the same kid at five different ages. The wiggling, screaming babies offer the most challenge. This picture is really cool. Love how they sort of fade to the background like ghosts. I wish I was going to be there! Someday I will plan well enough to be in Provo for the Children's Book Festival. Sigh. Lucky soldier - his mother must love him to have made that warm scarf. Not sure about the red - could be dangerous. That scarf has been comforting the soldier (and me) for a while now. I hope everything is going well with the Bible illustrations, and that Nathan can visit the space station again soon.